Every summer, I get the urge to play squirrel and start packing things away for the winter months ahead. 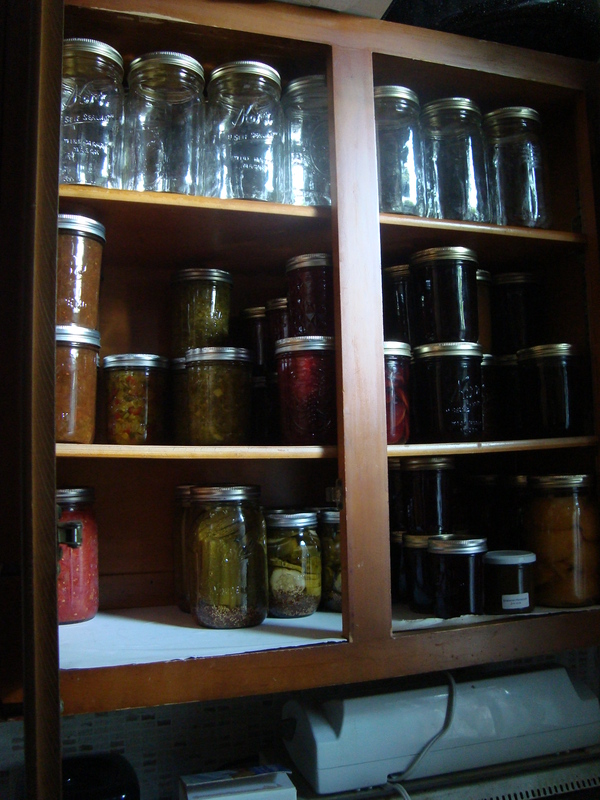 * As more and more beautiful produce comes to the garden (or this year, the farmers’ market), I find it harder and harder to resist the urge to pack it all up in jars to line our shelves. I’ve been slowly building up a collection of red currants, bought in pint quantities and frozen until canning time. Some became red currant jelly, and some became rhubarb red currant preserves that will make an amazing substitute for cranberry sauce at Thanksgiving time. And then there were the raspberries. Oh, the raspberries. There are many, and they are beautiful right now. We made a few jars of raspberry sauce, and a few more of raspberry jelly. I cannot tell you how in love I am with the raspberry jelly. So in love that it will be almost impossible to escape the summer without another batch (or three). Some things really are pure heaven. We’ll probably do a few more jars of the sauces, too. They make a great addition to plain yogurt for Branden’s breakfasts, and tend to be better than the fruit stuff that comes from the store. Fruit sauce will also work wonders on my rice pudding in the mornings, or on pancakes, as salad dressings, on ice cream, or anything else you can think to put it on. I know it’s a little early yet, but my mind is already beginning to turn toward fall, toward the tucking in and the storing up, laying aside jars of distilled summertime to be opened in the gray days of February. Seasons are a beautiful thing. *However, unlike our neighborhood squirrel, I tend to wait until things are ripe before picking, and I don’t make off with every. last. green tomato from someone else’s plants. Just saying. Slowly, slowly normalcy is beginning to return around the edges of our lives. I’ve given up hoping for a return of sanity (at least not until mid-August or so, anyway), but at least things are starting to quiet down again, and there are glimpses of downtime amidst the rush. On Saturday, we went to our new farmer’s market. 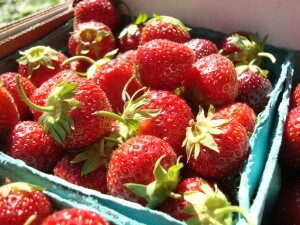 Actually, I almost missed strawberry season altogether this year. This was the last week for strawberries (and they were phenomenal) so we bought a lot. 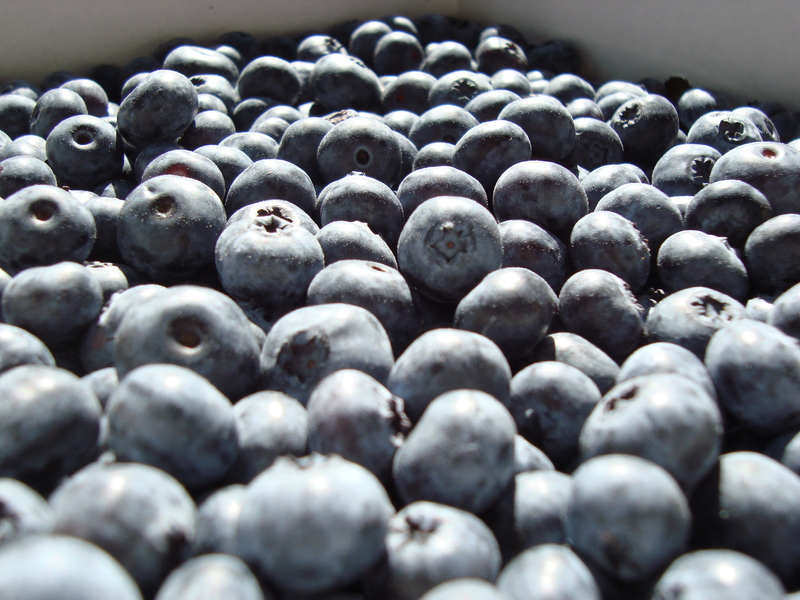 While we were at it, we bought blueberries, too. 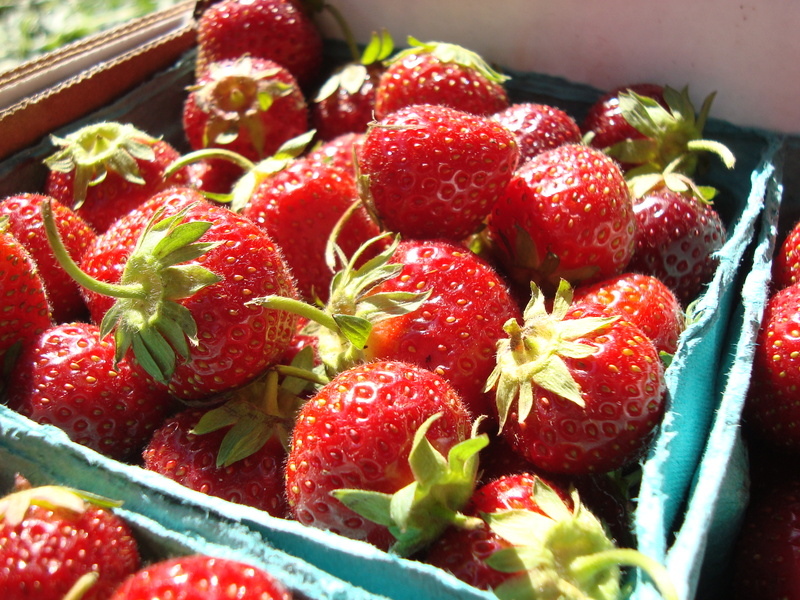 If you buy nothing else at the farmer’s market, buy your berries there. They are worlds better than the ones we’ve been getting in the grocery store while we’ve been too busy running around to make it to the market on Saturdays. There is nothing like this flavor, and they freeze beautifully. 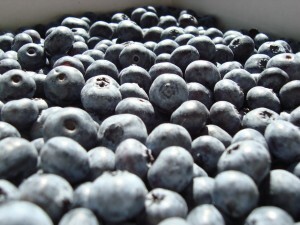 I’ve been using a lot of frozen fruits lately, and the store bought ones are just never the same as these that come fresh from the farm to my freezer at the height of summer. They are beautiful. We froze some, and then on Sunday I canned some. I’ve been hankering to try strawberry balsamic black pepper jam since I saw Elizabeth’s pictures on her blog, and so I started with that. I used low-sugar SureJell because that’s what I had, and kind of mushed together the SureJell and Ball book recipes to get what I wanted. The first day, I couldn’t taste the pepper much at all, but it’s beginning to bloom a bit now, and it adds a really interesting warmth to the jam. Definitely a keeper. I also made blueberry sauce, which thickened up beautifully despite having no added pectin or apple juice, a testament to the berries’ quality and ripeness. It has already become my favorite salad dressing base. A little sauce, some white wine vinegar, fresh herbs from the garden, olive oil and a little salt, and you have instant gourmet dressing. Love it. 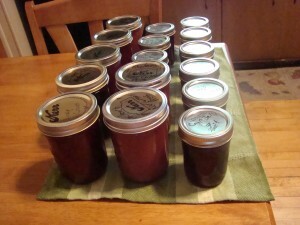 We don’t actually eat a lot of jam in our house, so most of the sweet canned goods I make end up turning into sweet-savory sauces of one kind or another. Plum and apricot preserves become sweet and sour sauce for chicken, strawberry, raspberry, and blueberry jams and sauces become salad dressings or pancake syrups. Cherry preserves get worked into muffins or brownie dough as extra moisture and flavor. Of course, the sauces and looser jams also make for amazing ice cream toppers, especially paired with chocolate sauce. Everything finds a use, and seldom on a piece of toast (especially since losing gluten, bread baking is not the same and certainly doesn’t happen as often). All the remaining jars from last years’ bounty, and a whole row of empties just waiting to be filled. Who could ask for more? And then, last night I finally sat down to do the finishing on the woven piece that I took off the loom just before the move. 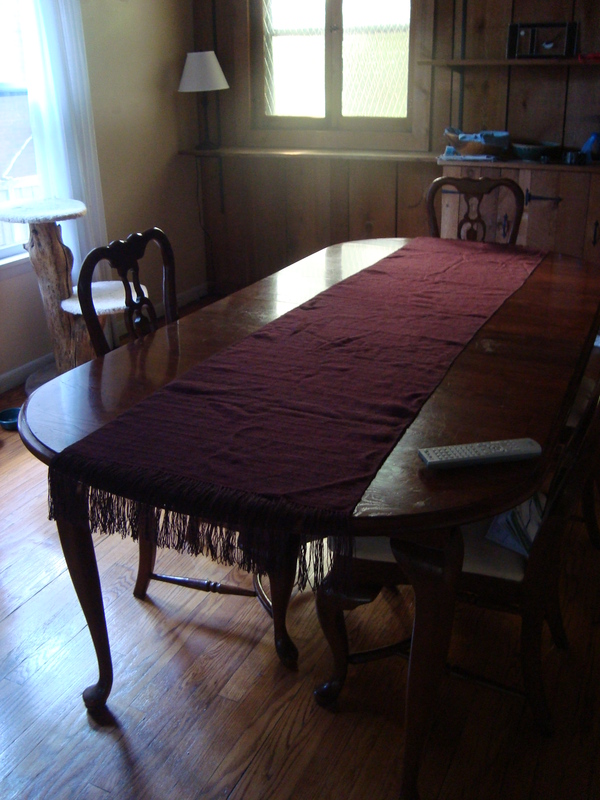 It would be nice if it were 6″ longer, but it fits almost perfectly on the dining room table that came with the house. I’m noticing in the picture that last night’s ironing didn’t really get out all the wrinkles, but I think I’m going to ignore that for now. I’m so pleased that it has found a home in the new place. Tonight is the first night that I am going to take off from unpacking and preparing the house for guests. We’ll be going again full swing tomorrow, but tonight is time for a cease-fire. I’m not honestly sure what I’m going to do; I’ve been going for so long that I’ve kind of forgotten what was queued up before the rush, but I’m sure I’ll find something. Knitting is closest, I have some weaving books to peruse in search of my next project, and the wheel is calling. There’s never a shortage of things to do, is there? DesigKnit is powered by	WordPress 4.8.9 . Page generated in 0.305 seconds using 30 queries.